I woke up this morning simply glowing with inspiration. 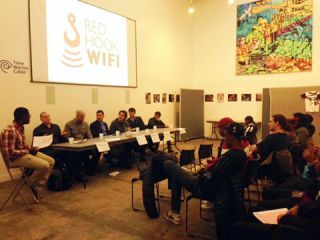 Last night I had the privilege of bringing a diverse panel of AV industry representatives to discuss the industry and career opportunities to a group of young adults in the Red Hook neighborhood of Brooklyn, NY. Back in December, I wrote about the Red Hook Initiative (RHI) community center’s Digital Stewards, a group of 19-24-year-olds installing a free Wi-Fi network across their technology starved area of Brooklyn. Read that blog for full background here if you missed it. They have been installing, maintaining, promoting, and supporting the Wi-Fi network through software and hardware troubleshooting. After a year in the Digital Stewards program, these ambitious young adults are looking for more training and jobs. I first learned about the Digital Stewards through Twitter and community news outlets—I live nearby RHI and followed the tremendous volunteer work the nonprofit facilitated in response to the devastation Hurricane Sandy brought to Red Hook. I knew there had to be a way to connect this great program to our industry. They were looking for technology jobs, and our industry is looking for young talent. So it seemed like a no-brainer to bring the two together. After attending a community meeting about the Red Hook Wi-Fi program, I hatched the idea for this event along with RHI’s director of media programs, Tony Schloss. I was really nervous prior to Wednesday’s panel—not knowing what to expect or if people would even show up. But my expectations were truly exceeded by the six industry guests and the 15 or so Red Hook youth who all brought a tremendously positive energy and actively participated in what turned out to be more of a round-table conversation than a panel. The gracious panel consisted of Steve Greenblatt, president of Control Concepts; Rob Badenoch and Alex Mayo, consultants from Shen Milsom & Wilke; Mark Feinberg of Home Theater Advisors; Aaron Harrow, an AV design manager at the Museum of Modern Art (MoMA); and Ethan McCarty, director of consulting and integration for IBM’s marketing and communications lab. After first discussing the nuances of each of their unique positions, the panelists each went on to respond to questions about problem solving, mentorship, training and certification, and programming skills. Greenblatt explained how problem solving is about thinking logically and eliminating potential trouble spots in a logical order. Harrow added that it was important to change one thing at a time when troubleshooting. McCarty encouraged self-directed learning, taking advantage of MOOCs (massive open online courses) and other online education sources, like Code Academy, TEDtalks, and Kahn Academy—a sentiment SM&W’s Badenoch echoed. Having a passion for the technology, and a mutual love of music and video resounded across the panel. They each had individual stories about how their passions led them to the AV industry, from Harrow’s youth making beats for a hip-hop group to Feinberg pulling apart electronics as a kid and later being the go-to person when friends needed a TV setup. More than having advanced degrees or a high GPA, all the panelists said they placed much more value on people that live the lifestyle. Harrow said he ignores degree type of information on a resume and looks for personal initiatives—how technology is a hobby for prospective employees. “If you love the work, you’ll do whatever you need to do to be able to work [with] this technology,” Badenoch said. One of Greenblatt’s best programmers, he said, has no college degree, but he’s the guy that goes home on the weekends and learns a new programming language. Mayo, as the youngest on the panel, really exemplified many of the ideas expressed through his frustration in college that there was no undergraduate degree anywhere for acoustics. He realized that AV consulting was a job, and that he was interested in it, and then he created his own major at the University of Hartford. He encouraged the young people to research companies out there that do what they want to do. That’s exactly how he ended up at SM&W; he found them on his own. One of the digital stewards was curious to know what keeps them going when the job gets tough and they feel like quitting. McCarty said having a network and being able to talk through frustrations with a friend or colleague helps him. Feinberg recalled his previous corporate career where he worked marketing women’s clothing, saying that he goes “back to the green dress” when his job gets tough. Mayo told the youths that he works backwards from his problem, reminding himself what he wants to do in his life to break through an impasse. The biggest overarching message was probably about the role the young people as individuals play in determining their own fates. Success is about making decisions and taking action to help move toward a goal—enlisting help from any type of personal connection you may have or technological resources available. “All you need to start a home theater company is a decent drill and a drywall saw,” Feinberg mused. After the huge success of this AV career panel, I’ll be planning more of these on a larger scale in the coming months, and I’ll be looking for manufacturer partners to host and help support the program. The idea is to create a channel for young technology enthusiasts to learn and network about AV careers while dually serving as an opportunity for integrators to mine for talent. Please contact me with any ideas, feedback, or interest in participating, at ladler[at]nbmedia[dot]com.